For other people named Omar Sharif, see Omar Sharif (disambiguation). Not to be confused with Umer Sharif. Omar Sharif (Arabic: عمر الشريف‎, Egyptian Arabic pronunciation: [ˈʕomɑɾ eʃʃɪˈɾiːf]; born Michel Dimitri Chalhoub [miˈʃel dɪˈmitɾi ʃælˈhuːb]; 10 April 1932 – 10 July 2015) was an Egyptian actor. He began his career in his native country in the 1950s, but is best known for his appearances in both English and American productions. His films included Lawrence of Arabia (1962), Doctor Zhivago (1965), and Funny Girl (1968). He was nominated for an Academy Award for Best Supporting Actor for Lawrence of Arabia. He won three Golden Globe Awards and a César Award. Sharif in a 1963 publicity photo. Sharif, who spoke Arabic, English, French, Spanish and Italian fluently, was often cast as a foreigner of some sort. He bridled at travel restrictions imposed by the government of Egyptian president Gamal Abdel Nasser, leading to self-exile in Europe. He was a lifelong horse racing enthusiast, and at one time ranked among the world's top contract bridge players. Omar Sharif, whose adopted surname means "noble" or "nobleman", was born as Michel Dimitri Chalhoub in Alexandria, Kingdom of Egypt, to a Melkite Catholic family of Lebanese descent. he belonged to a small ethnocultural minority known as the Levantine 'Antiochian' Greek Catholics of Egypt (Rum Katuleek), an offshoot of the Greek Orthodox Church of Antioch. His father, Joseph Chalhoub, a precious woods merchant moved to the port city of Alexandria in the early 20th century from Zahle in Lebanon. Sharif was later born in Alexandria. His family moved to Cairo when he was four. His mother, Claire Saada was from Zahle. She was a noted society hostess, and Egypt's King Farouk was a regular visitor prior to his deposition in 1952. In his youth, Sharif studied at Victoria College, Alexandria, where he showed a talent for languages. He later graduated from Cairo University with a degree in mathematics and physics. He worked for a while in his father's precious wood business before beginning his acting career in Egypt. In 1955, Sharif changed his name to Omar El-Sharif and converted to Islam in order to marry fellow Egyptian actress Faten Hamama. It is widely reported, without evidence, that Omar Sharif studied acting at the Royal Academy of Dramatic Art in London, but the academy confirmed to Al Jazeera that this is in fact not true. A close up shot from Sharif's movie There is a Man in our House Produced in 1961. In 1954, Sharif began his acting career in Egypt with a role in The Blazing Sun. He was also in Shaytan Al-Sahra ("Devil of the Desert"). In the same year he appeared in Sira` Fi al-Wadi ("Struggle in the Valley"). He quickly rose to stardom, appearing in Our Beautiful Days (1955), The Lebanese Mission (1956) (a French film), Struggle in the Pier (1956), Sleepless (1957) ("[La Anam]"), Land of Peace (1957), Goha (1958) (a Tunisian film that marked the debut of Claudia Cardinale), Struggle on the Nile (1958), Lady of the Palace (1960), A Beginning and an End (1960), A Rumor of Love (1960), Sayyidat al-Qasr, the Anna Karenina adaptation The River of Love ("Nahr El-Hob") in 1961 and There is a Man in our House (1961). He and his wife co-starred in several movies as romantic leads. Sharif's first English-language role was that of (the fictitious) Sherif Ali in David Lean's historical epic Lawrence of Arabia in 1962. Sharif was given the role when Dilip Kumar turned it down, Horst Buchholz proved unavailable and Maurice Ronet could not use the contact lenses necessary to hide his eyes. To secure the role, Sharif had to sign a seven-film contract with Columbia at $50,000 a film. Lawrence was a box office and critical sensation. Sharif's performance earned him an Academy Award for Best Supporting Actor nomination and a Golden Globe Award for Best Supporting Actor – Motion Picture, as well as a shared Golden Globe Award for New Star of the Year – Actor. Sharif went on to star in another Hollywood blockbuster, Anthony Mann's The Fall of the Roman Empire (1964) where he played the support role of Sohaemus of Armenia. Sharif was third-billed in Columbia's Behold a Pale Horse (1964), playing a priest in the Spanish Civil War alongside Gregory Peck and Anthony Quinn. Director Fred Zinnemann said he chose Sharif partly on the suggestion of David Lean. "He said he was an absolutely marvellous actor, 'If you possibly can, take a look at him.'" Film historian Richard Schickel wrote that Sharif gave a "truly wonderful performance", especially noteworthy because of his totally different roles in Lawrence of Arabia: "It is hard to believe that the priest and the sheik are played by the same man". The film, like Fall of the Roman Empire, was a commercial disappointment. Sharif was one of many stars in MGM's The Yellow Rolls-Royce (1964), playing a Yugoslav wartime patriot; the movie was a hit. Sharif had his first lead role in a Hollywood movie when he was cast in the title part of Genghis Khan (1965). Produced by Irving Allen and directed by Henry Levin for Columbia, the $4.5 million epic was a box office disappointment. He had a supporting role in a French Marco Polo biopic, Marco the Magnificent (1965), starring Buchholz and Quinn. With Geraldine Chaplin in Doctor Zhivago (1965). While making Genghis Khan Sharif heard that Lean was making an epic love story Doctor Zhivago (1965), an adaptation of Boris Pasternak's 1957 novel. Sharif was a fan of the novel and pitched himself for one of the supporting roles; Lean decided to cast him in the lead, as Yuri Zhivago, a poet and physician. Film historian Constantine Santas explained that Lean intended the film to be a poetic portrayal of the period, with large vistas of landscapes combined with a powerful score by Maurice Jarre. He noted that Sharif's role is "passive", his eyes reflecting "reality" which then become "the mirror of reality we ourselves see". In a commentary on the DVD (2001 edition), Sharif described Lean's style of directing as similar to a general commanding an army. :xxviii The film was a huge hit. For his performance, Sharif won the Golden Globe Award for Best Actor – Motion Picture Drama. Sharif followed it with a cameo in The Poppy Is Also a Flower (1966). He, O'Toole and Lawrence producer Sam Spiegel were reunited in The Night of the Generals (1967), playing a German officer in World War Two, his fourth movie for Columbia. The film was not a success. Neither was the Italian-French fairytale More Than a Miracle (1967), despite its co-starring Sophia Loren. Sharif co-starred with Catherine Deneuve in Mayerling (1968), playing Rudolf, Crown Prince of Austria. He was reunited with Peck in a Western at Columbia, Mackenna's Gold (1969), an unsuccessful attempt to repeat the success of The Guns of Navarone (1961). At 20th Century Fox he played Che Guevara in Che! which flopped. The Appointment (1969) teamed Sharif with Anouk Aimée and director Sidney Lumet but was not a hit. James Clavell's The Last Valley (1971) was a huge flop, despite co-starring Michael Caine. The Horsemen (1971), directed by John Frankenheimer and the last movie under his Columbia contract, also performed poorly at the box office. Sharif later said, "What killed my career was appearing in a succession of films you wouldn't turn down. They were by good directors, but they were bad films." He specifically referenced Behold a Pale Horse, The Appointment and The Horsemen. The Burglars (1971), a French crime film with Jean-Paul Belmondo and Dyan Cannon was a huge hit in France but little seen in the English speaking world. Sharif played Captain Nemo for European TV in an adaptation of Mysterious Island (1973). Sharif appeared in a thriller alongside Julie Andrews for Blake Edwards, The Tamarind Seed (1974). He supported Richard Harris and David Hemmings in a thriller, Juggernaut (1974). Sharif reprised the role of Nick Arnstein in the sequel to Funny Girl, Funny Lady in 1975. He starred in a West German thriller Crime and Passion (1976) and had a cameo in Edwards' The Pink Panther Strikes Again (1976). Sharif had a small role in Ashanti (1979), starring Caine and a bigger one in Bloodline (1979). "I lost money on gambling, buying horses, things like that," he later said. "So I made those movies which I knew were rubbish... I'd call my agent and tell him to accept any part, just to bail myself out." Sharif had a lead part in a spy spoof, S*H*E (1980) and was second-billed (after James Coburn) in The Baltimore Bullet (1980). He had supporting parts in a Chevy Chase comedy Oh! Heavenly Dog (1981) and a Ryan O'Neal thriller Green Ice (1981), and a small role in the comedy Top Secret! (1984). He appeared on stage in a production of The Sleeping Prince in 1983, saying he "appeared in the bad films of great directors". Sharif worked steadily in television, appearing in Peter the Great (1986), and Anastasia: The Mystery of Anna (1986) (as Nicholas II of Russia). He had supporting parts in Grand Larceny (1987) and The Possessed (1988). His first notable credit in a while was Mountains of the Moon (1990) but Sharif's part was only small. Sharif was reunited with O'Toole a third time in The Rainbow Thief (1990). He went to Egypt for War in the Land of Egypt (1991) and France for Mayrig (1991) with Claudia Cardinale, an autobiographical tale for Henri Verneuil. The latter was popular enough for a sequel, 588 rue paradis (1992). Sharif could also be seen in Memories of Midnight (1991), Beyond Justice (1992), Catherine the Great (as Alexei Razumovsky), Gulliver's Travels (1996), Heaven Before I Die (1997), and Mysteries of Egypt (1998). I said to myself, 'Let us stop this nonsense, these meal tickets that we do because it pays well.' I thought, 'Unless I find a stupendous film that I love and that makes me want to leave home to do, I will stop.' Bad pictures are very humiliating, I was really sick. It is terrifying to have to do the dialogue from bad scripts, to face a director who does not know what he is doing, in a film so bad that it is not even worth exploring." Sharif at the Venice Film Festival in 2009. Sharif did have a small role in The Parole Officer (2001). In 2003 he said, "I went 25 years without making a good film." In 2003, Sharif received acclaim for his leading role in Monsieur Ibrahim, a French-language film adaptation of the novel Monsieur Ibrahim et les fleurs du Coran, as a Muslim Turkish merchant who becomes a father figure for a Jewish boy. For this performance, Sharif received the César Award for Best Actor. It has nice big chunks of dialogue, which is what I like to do, rather than riding horses or camels. I'd turned down everything and stopped working for four years. I said, 'I'm going to stop doing that rubbish and keep some dignity.' But when I read the script for 'Monsieur Ibrahim,' I phoned the producers immediately. I said, 'Hang on, I'm coming, wait for me.' My problem is finding parts. When you're young and successful, they write or adapt parts for you. But when you're an old chap, let's be frank, you don't sell tickets anymore. If they need an old Englishman, American or Italian, there are plenty of actors around. So what's open for me? Old Arabs. And that's what I play in this film. Sharif's later film roles included performances in Hidalgo (2004), Imperium: Saint Peter (2005) playing the title role for Italian television, and One Night with the King (2005) (again with O'Toole). Sharif could be seen in The Ten Commandments (2006). In Egypt he starred in Hassan and Marcus (2008) with Adel Emam' and was in The Traveller (2009). He had support roles in The Last Templar (2009) and Rock the Casbah (2013). Sharif's final role was as lead actor in the short science education film 1001 Inventions and the World of Ibn Al-Haytham, which was directed by Ahmed Salim and was released as part of the United Nations' International Year of Light campaign, operated by UNESCO. Sharif playing contract bridge in the Netherlands, 1967. Sharif said bridge was his personal passion and at one time was ranked among the world's top 50 contract bridge players. At the 1964 World Bridge Olympiad he represented the United Arab Republic bridge squad and in 1968 he was playing captain of the Egyptian team in the Olympiad. In 1967 he formed the Omar Sharif Bridge Circus to showcase bridge to the world and invited professional players including members of the Italian Blue team, which won 16 World championship titles, to tour and promote the game via exhibition matches including one watched by the Shah of Iran. Touring through Europe, the Circus attracted thousands of spectators who watched the matches via Bridge-O-Rama, a new technology (and predecessor to the modern-day VuGraph) that displayed bidding and cardplay on television monitors. Players included Benito Garozzo, (considered by many as the greatest bridge player of all time) plus his Italian compatriots Pietro Forquet and Giorgio Belladonna and Frenchman Claude Delmouly. In 1970, Sharif and the circus went to London's famous Piccadilly Hotel for an 80-rubber match against British experts Jeremy Flint and Jonathan Cansino. The stakes were £1 per point, huge stakes even by today's standards. The event was to present bridge as a rich, exciting spectacle and to break through into television to bring the game within the reach of millions. The Circus ultimately won the match by 5,470 points, but Sharif still incurred a net loss after paying all related expenses. The Circus, under the management of Mike Ledeen, toured Canada and the U.S. in 1970—71. Sharif's team joined with the Dallas Aces for a seven-city tour of Chicago, Winnipeg, Los Angeles, Minneapolis-St. Paul, Dallas, Detroit and Philadelphia. In each city, a team of local experts participated in the exhibition. In 1975, sponsored by the Lancia division of Fiat, Sharif and members of the Italian Blue Team faced off in four challenge matches against American teams. Sharif's team won in Chicago, but was defeated in New York, Los Angeles and Miami. The Omar Sharif World Individual Championship held in 1990 offered the largest total purse ($200,000) in the history of bridge. In 1997, he was a member of the Committee of Honour for the Bermuda Bowl on the first time it was held in an Arab Country, Tunisia. He competed in a transnational team (with French, German and Lebanese players) and finished 11th. In 1999 he played in a French senior team at the European Championships in Malta, finishing second. In 2000 at Maastricht, he joined Egypt's senior team, finishing in ninth place. With Charles Goren and later Tannah Hirsch, Sharif contributed to a syndicated newspaper bridge column for the Chicago Tribune. He was also both author and co-author of several books on bridge and licensed his name to a bridge video game, Omar Sharif Bridge, initially released in an MS-DOS version and Amiga version in 1992 and is still sold in Windows and mobile platform versions. He was also the hand analyst commentator for the Epson worldwide bridge contests. Sharif was a regular in casinos in France. By 2000 Sharif had stopped playing bridge entirely. Having once proudly declared the game his passion, he now considered it an addiction: "I didn't want to be a slave to any passion anymore. I gave up card playing altogether, even bridge and gambling." Sharif, however, continued to license his name to bridge software games, and co-authored a book with bridge writer David Bird, "Omar Sharif Talks Bridge". Written in 2004, it includes some of his most famous deals and bridge stories. A scene from the movie Land of Peace (1957). Sharif lived in Egypt from his birth in 1932 until he moved to Europe in 1965. He recounted that in 1932, his father "wasn't a wealthy man", but "earned quite a bit of money". Before the Egyptian Revolution of 1952, King Farouk frequented Sharif's family home, and became a friend and card-game partner of Sharif's mother. His mother was an elegant and charming hostess who was all too delighted with the association because it gave her the privilege of "consorting only with the elite" of Egyptian society. Sharif also recounted that his father's timber business was very successful during that time in ways that Sharif describes as dishonest or immoral. By contrast, after 1952, Sharif stated that wealth changed hands in Egypt, under Nasser's nationalisation policies. His father's business "took a beating". 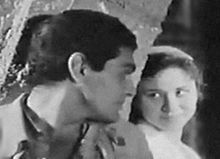 In 1954, Sharif starred in the film Struggle in the Valley with Faten Hamama, who shared a kiss with him although she had previously refused to kiss on screen. The two fell in love; Sharif converted to Islam, changed his name, and married her. They had one son, Tarek Sharif, born in 1957 in Egypt, who appeared in Doctor Zhivago as Yuri at the age of eight. The couple separated in 1966 and their marriage ended in divorce in 1974. Sharif never remarried; he stated that after his divorce he never fell in love with another woman again. Sharif was also one of the ambassadors of Egypt's bid for the 2010 FIFA World Cup which lost out to South Africa. The Nasser government imposed travel restrictions in the form of "exit visas", so Sharif's travel to take part in international films was sometimes impeded, something he found to be intolerable. These restrictions influenced Sharif's decision to remain in Europe between his film shoots, a decision that cost him his marriage, though the couple remained friends. It was a major crossroad in Sharif's life and changed him from an established family man to a committed bachelor living in European hotels. When commenting about his fame and life in Hollywood, Sharif said, "It gave me glory, but it gave me loneliness also. And a lot of missing my own land, my own people and my own country". When Sharif's affair with Streisand was made public in the Egyptian press, his Egyptian citizenship was almost withdrawn by the Egyptian government because of Streisand's being Jewish and a vocal supporter of Israel, which was then in a state of war with Egypt. Sharif became friends with Peter O'Toole during the making of Lawrence of Arabia. They appeared in several other films together and remained close friends. He was also good friends with Egyptologist Zahi Hawass. Actor and friend Tom Courtenay revealed in an interview for the 19 July 2008 edition of BBC Radio's Test Match Special that Sharif supported Hull City Association Football Club and in the 1970s he would telephone their automated scoreline from his home in Paris for score updates. Sharif was given an honorary degree by the University of Hull in 2010 and he used the occasion to meet Hull City football player Ken Wagstaff. Sharif also had an interest in horse racing spanning more than 50 years. He was often seen at French racecourses, with Deauville-La Touques Racecourse being his favourite. Sharif's horses won a number of important races and he had his best successes with Don Bosco, who won the Prix Gontaut-Biron, Prix Perth and Prix du Muguet. He also wrote for a French horse racing magazine. In later life, Sharif lived mostly in Cairo with his family. In addition to his son, he had two grandsons, Omar (born 1983 in Montreal) and Karim. 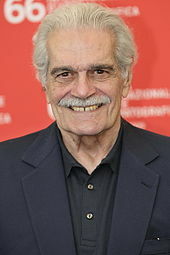 The younger Omar Sharif is also an actor. Sharif was very supportive of the 2011 Youth revolution in his home country and asked for the resignation of Hosni Mubarak, stating: "Given that the entire Egyptian people don't want him and he's been in power for 30 years, that's enough". Sharif had a triple heart bypass operation in 1992 and suffered a mild heart attack in 1994. Until his bypass, Sharif smoked 100 cigarettes a day. He quit smoking after the operation. In May 2015, it was reported that Sharif was suffering from Alzheimer's disease. His son Tarek Sharif said that his father was becoming confused when remembering some of the biggest films of his career; he would mix up the names of his best-known films, Doctor Zhivago and Lawrence of Arabia, often forgetting where they were filmed. On 10 July 2015, less than six months after his former wife's death at the same age, Sharif died after suffering a heart attack at a famous psychiatric hospital in Cairo called The Behman Hospital. On 12 July 2015, Sharif's funeral was held at the Grand Mosque of Mushir Tantawi in eastern Cairo. The funeral was attended by a group of Sharif's relatives, friends and Egyptian actors, his coffin draped in the Egyptian flag and a black shroud. His coffin was later taken to the El-Sayeda Nafisa cemetery in southern Cairo, where he was buried. At the 35th Academy Awards, Sharif was nominated for Best Supporting Actor for his role as Sherif Ali in Lawrence of Arabia but lost to Ed Begley. He won two Golden Globe awards in the same year for his role. In 1966, he won a third Golden Globe award for the titular role in the film Doctor Zhivago. In November 2005, Sharif was awarded the inaugural Sergei Eisenstein Medal by the United Nations Educational, Scientific and Cultural Organization (UNESCO) in recognition of his significant contributions to world film and cultural diversity. The medal, which is awarded very infrequently, is named after Russian director Sergei Eisenstein. Only 25 have been struck, as determined by the agreement between UNESCO, Russia's Mosfilm and the Vivat Foundation. ^ Berkvist, Robert (10 July 2015). "Omar Sharif, 83, a Star in Lawrence of Arabia and Doctor Zhivago, Dies". The New York Times. Retrieved 10 July 2015. ^ "(Title unknown)". The Arab Review (27–30): 56. 1962. ^ Sadoul, Georges (1972). Morris, Peter (ed.). Dictionary of Films. Berkeley and Los Angeles: University of California Press. p. 129. ISBN 9780520021525. Retrieved 10 July 2015 – via Google Books. ^ a b "Omar Sharif, Star of 'Lawrence of Arabia,' Dies of Heart Attack at 83". NBC.com. Retrieved 10 July 2015. ^ Khakpour, Porochista (2013). "In the House of Desire, Honey, Marble, and Dream". In Anita Amirrezvani; Persis Karim (eds.). Tremors: New Fiction by Iranian American Writers. University of Arkansas Press. p. 116. ^ Adel Iskander; Hakem Rustom, eds. (2010). Edward Said: A Legacy of Emancipation and Representation. Berkeley and Los Angeles: University of California Press. ISBN 9780520245464. Retrieved 10 July 2015 – via Google Books. ^ Curtis, Edward E. (2010). Encyclopedia of Muslim-American History. Facts on File. p. 198. ISBN 978-0816075751. ^ Rastegar, Kamra (10 July 2015). "Omar Sharif: Alluringly cosmopolitan, unapologetically Arab". Al Jazeera America. Retrieved 1 December 2016. ^ Marlowe, Lara (8 May 2014). "Omar Sharif: from desert prince to alone in Paris". The Irish Times. Retrieved 12 July 2015. ^ Matthew Bannister (12 July 2015). Omar Sharif, Stanley 'Steve' Moore, Jules Wright, Yevgeny Primakov, Ernest Tomlinson. Last words. BBC. ^ a b "Obituary: Omar Sharif". BBC News. BBC. 10 July 2015. Retrieved 10 July 2015. ^ a b c "Omar Sharif: from desert prince to alone in Paris". The Irish Times. 8 May 2014. Retrieved 10 July 2015. ^ El Mundo Magazine, "Entrevista: Omar Sharif", by Eugenia Yagüe, 2002, retrieved 12 July 2015. ^ Sharif, Omar (1977), The Eternal Male: My Own Story, Doubleday, NY, 1st Ed., p. 71. ^ "Omar Sharif". Retrieved 10 July 2015. ^ "Omar Sharif: Why Google honours him today". www.aljazeera.com. Retrieved 22 April 2018. ^ "Faten Hamama, actress – obituary". The Daily Telegraph. 18 January 2015. Retrieved 10 July 2015. ^ "Omar Sharif, star of Lawrence of Arabia, has Alzheimer's – agent". The Guardian. 25 May 2015. Retrieved 10 July 2015. ^ Stuart Heritage (15 November 2012). "Omar Sharif on Lawrence of Arabia: 'I was the only actor David Lean liked'". the Guardian. Retrieved 13 July 2015. ^ "The 35th Academy Awards". AMPAS. Retrieved 10 July 2015. ^ "Omar Sharif". HFPA. Archived from the original on 11 July 2015. Retrieved 10 July 2015. ^ "Broadway Review: 'Doctor Zhivago'". Variety. 21 April 2015. Retrieved 10 July 2015. ^ "Doctor Zhivago". Hollywood Foreign Press Association (HFPA). Retrieved 10 July 2015. ^ "Schlinder's List draws crowds around the world". Entertainment Weekly. 15 April 1994. Retrieved 10 July 2015. ^ "Box Office Films of 1971". Box Office Story. Retrieved 12 September 2016. ^ "Funny Lady Movie Review & Movie Summary (1975)". Roger Ebert. 13 March 1975. Retrieved 10 July 2015. ^ .PLAY IT AGAIN, SHARIF--ON STAGE Blume, Mary. Los Angeles Times 1 Dec 1983: i2. ^ "Monsieur Ibrahim Movie Review (2003)". Roger Ebert. 5 March 2004. Retrieved 10 July 2015. ^ "Omar Sharif: 'It is a great film, but I'm not very good in it'". The Independent. 18 November 2012. Retrieved 10 July 2015. ^ "Omar Sharif". Les César Académie des Arts et Techniques du Cinéma. Retrieved 10 July 2015. ^ Lee, Benjamin (10 July 2015). "Omar Sharif dies at the age of 83". The Guardian. ISSN 0261-3077. Retrieved 14 November 2017. ^ "Omar Sharif, Suave Star of 'Doctor Zhivago,' Dies at 83". Hollywood Reporter. Retrieved 23 July 2015. ^ "Ibn Al-Haytham to be a focus of the International Year of Light through partnering with 1001 Inventions". UNESCO. Retrieved 23 July 2015. ^ "Omar Sharif 1932 – 2015". worldbridge.org. ^ "Omar Sharif World Individual Championship". Bridgehands.com. ^ "Omar Sharif Individual". ACBLstory. 15 October 2012. ^ "Omar Sharif 1932-2015". Bridgeblogging.com. ^ "Change of Subject – Observations, reports, tips, referrals and tirades". Chicago Tribune Blog. 6 September 2005. ^ "OMAR SHARIF BRIDGE PC DOWNLOAD". Thetradingcentre.co.uk. Retrieved 18 November 2012. ^ "Omar Sharif sued for assault". (6 November 2005). New Sunday Times, p. 29. ^ Sharif, Omar (1977), The Eternal Male: My Own Story, Doubleday, NY, 1st Ed., p. 41. ^ Sharif, Omar (1977), The Eternal Male: My Own Story, Doubleday, NY, 1st Ed., pp. 45–46. ^ Sharif, Omar (1977), The Eternal Male: My Own Story, Doubleday, NY, 1st Ed., p. 46. ^ Sharif, Omar (1977), The Eternal Male: My Own Story, Doubleday, NY, 1st Ed., p. 98. ^ Al-Shafii, Alaa (19 January 2015). "Egyptian Movie Icon Faten Hamama's Extraordinary Life and Career". Al Akhbar. Retrieved 11 July 2015. ^ Darwish, Mustafa (1998). Dream Makers on the Nile: A Portrait of Egyptian Cinema. Columbia University Press. ISBN 978-977-424-429-2. ^ a b c d e f AlJazeeraEnglish (10 October 2007). "Riz Khan – Omar Sharif". YouTube. Retrieved 18 November 2012. ^ Sharif, Omar (1977), The Eternal Male: My Own Story, Doubleday, NY, 1st Ed., p. 79. ^ "THEY are two of the greatest names in film history". This is Hull and East Riding. 15 July 2010. Archived from the original on 18 July 2010. Retrieved 18 November 2012. ^ "Horse report for Don Bosco (FR)". theracehorse.com. ^ "Omar Sharif's passion for horse racing". albawaba online. 12 July 2015. ^ Burton, Scott. "Actor and racehorse owner Omar Sharif dies". Racing Post. Retrieved 10 July 2015. ^ "Egypt protests: Actor Omar Shariff worries about his country, but wants President Mubarak to resign". NY Daily News. January 2011. ^ "Omar Sharif, star of Lawrence of Arabia, has Alzheimer's – agent". the Guardian. Associated Press. 25 May 2015. Retrieved 13 July 2015. ^ "Film star Omar Sharif dies aged 83". BBC News. 10 July 2015. Retrieved 10 July 2015. ^ Loveluck, Louisa (12 July 2015). "Hollywood icon Omar Sharif draped in the Egyptian flag and laid to rest in Cairo". The Telegraph. ^ "United Nations News Centre". UN News Service Section. 24 November 2005. Retrieved 10 July 2015. ^ "Egyptian film icon Omar Sharif has Alzheimer's". Al-Ahram. 24 May 2015. Retrieved 10 July 2015. ^ a b c "ساحر السينما عمر الشريف أنهى المشهد الأخير في هذه الحياة". An-Nahar. 10 July 2015. Retrieved 10 July 2015. ^ Terrace, Vincent (1985). Encyclopedia of Television Series, Pilots and Specials, Volume 2. VNR AG. p. 358. ISBN 9780918432612. ^ "Arielle Dombasle : Omar Sharif, "légendaire" et "tourmenté"". Europe 1. 10 July 2015. Archived from the original on 11 July 2015. Retrieved 10 July 2015. ^ "وفاة الفنان العالمي عمر الشريف". RT. 10 July 2015. Retrieved 10 July 2015. ^ "Quand Omar Sharif tournait dans les P.-O. "J'ai oublié de te dire" et jouait les supporteurs de l'USAP". L'Indépendant. 10 July 2015. Retrieved 10 July 2015. ^ "IMdb: Edge of the Wind". Retrieved 9 August 2018. Hawass, Zahi (16 July 2015). "Goodbye my friend". Retrieved 9 January 2016. Wikimedia Commons has media related to Omar Sharif. "International record for Omar Sharif". World Bridge Federation.